The average cost of memory care in Kanawha County is $4,839 per month. This is higher than the national median of $4,650. To help you with your search, browse the 1 review below for memory care facilities in Kanawha County. On average, consumers rate memory care in Kanawha County 4.0 out of 5 stars. Caring.com has helped thousands of families find high-quality senior care. To speak with one of our Family Advisors about memory care options and costs in Kanawha County, call (855) 863-8283. Kanawha County, which includes West Virginia's capital and most populous city Charleston, has more than 183,000 people. Many of the 38,000 seniors in West Virginia who have Alzheimer's and other forms of dementia live in Kanawha County. There are four memory care facilities in the area that can provide care for this group. The state of Virginia officially calls these facilities Assisted Living Residences (ALRs), and they may or may not contain Alzheimer’s/dementia special care units (ASCUs). Kanawha County is home to world-class medical facilities, including those specializing in brain health and dementia care, such as West Virginia OrthoNeuro, in the event of medical emergencies or illness. Particle pollution has improved from seven to zero high pollution days in Kanawha County from 2007 to 2015, so seniors with breathing problems shouldn't be concerned that the air will worsen their condition. The county has a passing grade for annual particle pollution and a "C" for ozone. On average, Kanawha County is cloudier and wetter than other parts of the country. The county gets 46 inches of rain and 32 inches of snow per year. Winters are cold and summers can be hot and humid, so families should consider whether their loved ones would enjoy living in such an environment. For families seeking an affordable lifestyle for their loved ones with Alzheimer's or dementia, the overall cost of living in Kanawha county is 15 percent below the national average. Housing, in particular, is nearly 50 percent lower than the U.S. average. For seniors, Social Security income is only taxable if their total income is above $50,000 per year. For 401(k)s, IRAs, and pensions, the first $6,000 of income per year is deductible. 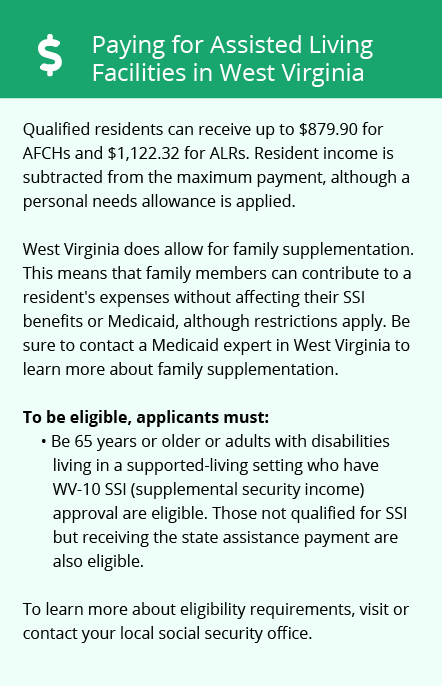 These West Virginia tax policies may make memory care more affordable for families on limited budgets. Memory Care costs in Kanawha County start around $4,839 per month on average, while the nationwide average cost of memory care is $4,799 per month. It’s important to note that memory care rates in Kanawha County and the surrounding suburbs can vary widely based on factors such as location, the level of care needed, apartment size and the types of amenities offered at each community. Kanawha County and the surrounding area are home to numerous government agencies and non-profit organizations offering help for seniors searching for or currently residing in an assisted living community. These organizations can also provide assistance in a number of other eldercare services such as geriatric care management, elder law advice, estate planning, finding home care and health and wellness programs. To see a list of free memory care resources in Kanawha County, please visit our Assisted Living in West Virginia page. 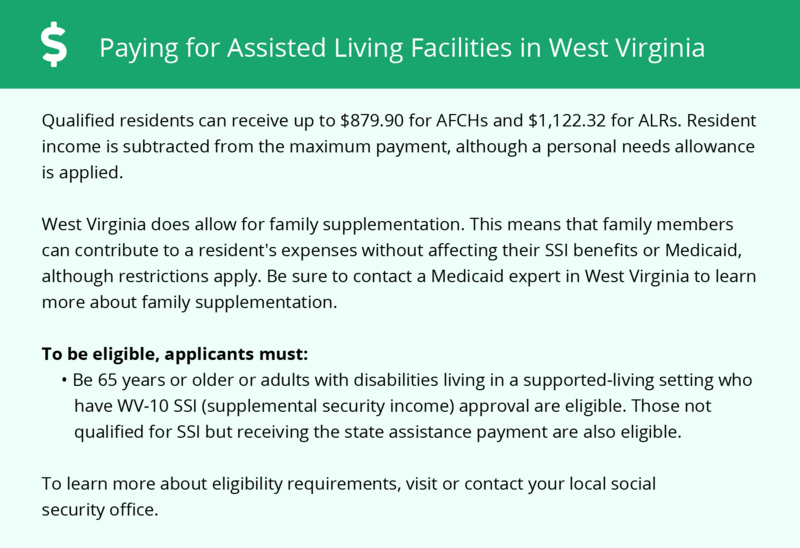 Kanawha County-area assisted living communities must adhere to the comprehensive set of state laws and regulations that all assisted living communities in West Virginia are required to follow. Visit our Memory Care in West Virginia page for more information about these laws.